Arrived faster than expected. The product is exactly as the pictures. I like the quality, the tables came with glass top. I like the fact that the cushion covers are removable and washable! Great piece and you can do so many arrangements with it. 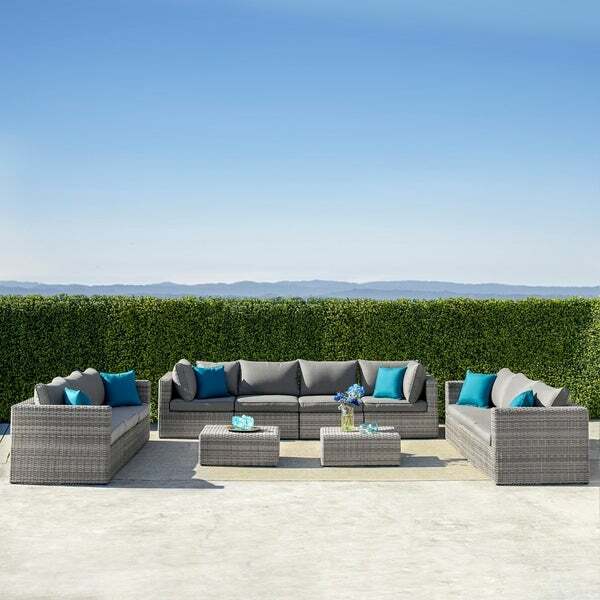 Including 12 high-quality pieces, this outdoor wicker sofa set by Havenside Home is a comfortable, stylish addition to your patio. Featuring a water and UV resistant aluminum frame and five-millimeter-thick glass, each piece is separate for personalized arrangement, and the pieces clip together to create a sofa large enough for tranquil and luxurious gatherings. Hand-woven wicker is resistant to inclement weather and the rays of the sun for years of effortless elegance. We received our order within a few weeks. We are very happy with the look of the furniture and it seems very comfortable. We live up north so haven't had the opportunity to give it a lot of use yet. I gave this 4 stars for two reasons: First, the pillows we received were a pea green color, not the peacock blue that was described and shown in the picture, and Secondly, the two tables are extremely low (as shown in the picture). I think they would be much better if they were a bit taller to put drinks and food on. Also, I thought I read that they were supposed to have a glass top, but I could be mistaken. All in all the furniture looks really nice, worth the money and so far we are very happy with it. "Will you be getting this in grey again?" The grey color should be available in late May. "What is the thickness of the cushions"
The thickness of cushion is 3.94 inches.